Today Raghuram Rajan to spell out his maiden monetary policy review. Now wait for the oohs and aahs. But I would be more interested on the discussion After the announcement of the Mid-Quarter Review of Monetary Policy Statement 2013-14, Dr. Raghuram Rajan, Governor and Deputy Governors of the Reserve Bank of India will interact with researchers/analysts through teleconference between 3.30 p.m. and 4.30 pm on Friday, September 20, 2013. 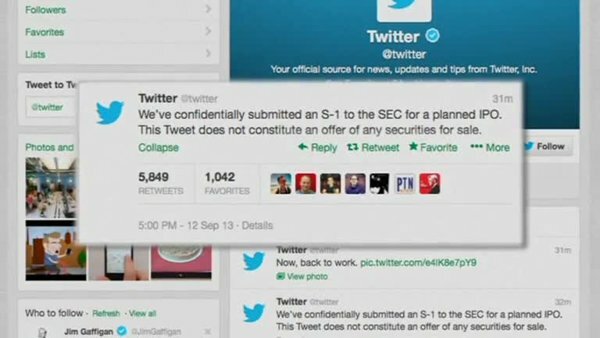 Twitter has finally announced plans to go public, though its formal filing was confidential, kicking off a frenzy of analysis, debating and, of course, tweeting over just how much the social-networking service is worth. That doesn’t leave potential investors much to go on – except history. And when it comes to flotations, history gives a pretty solid message: if you get an allocation, sell it on the first day, and put the money into the wider market instead. Even if the new shares go up later, they typically lag behind the market – with the smallest companies doing worst of all. No one wants to see another Facebook (FB) debacle. Amid trading glitches and secret, negative analyst views, Facebook shares dropped below their initial price of $38 on the very first day and dropped below $19 in late 2012. The shares only regained the $38 level last month, 14 months after the IPO, and are now trading at around $44. But the biggest problem with Facebook’s IPO may simply have been the overvalued stock price given the company’s financial future as it could be forecast at the time. A company surrounded by unanswered questions on its mobile-advertising strategy probably should not have been priced at an overall $100 billion valuation. As the conversation about Twitter intensifies, investors may be wise to keep Facebook’s turbulent past in mind. Buying shares at the I.P.O. led to losses, though shares in Facebook are now higher than the offering price. But being bearish as the company recovered also was a bad bet.